Chitinophaga pinensis Sangkhobol and Skerman 1981 is the type strain of the species which is the type species of the rapidly growing genus Chitinophaga in the sphingobacterial family ‘Chitinophagaceae’. Members of the genus Chitinophaga vary in shape between filaments and spherical bodies without the production of a fruiting body, produce myxospores, and are of special interest for their ability to degrade chitin. Here we describe the features of this organism, together with the complete genome sequence, and annotation. 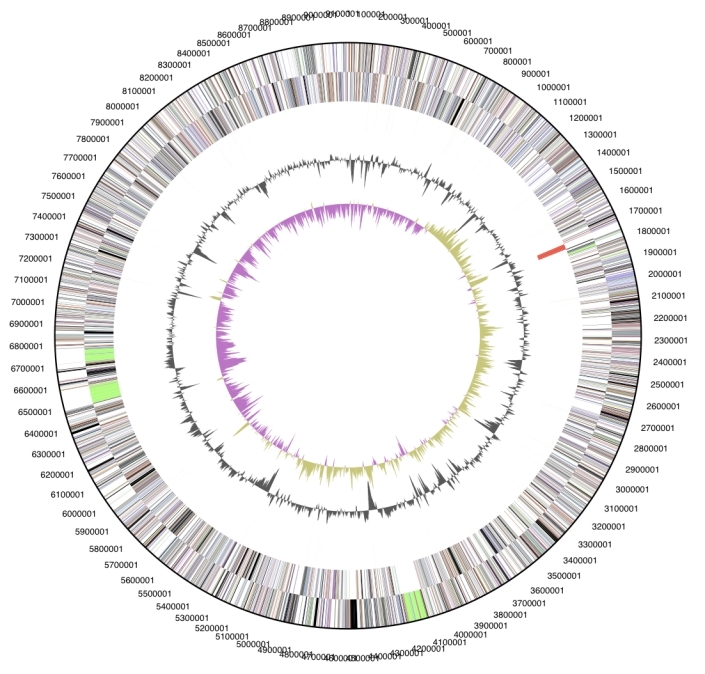 This is the first complete genome sequence of a member of the family ‘Chitinophagaceae’, and the 9,127,347 bp long single replicon genome with its 7,397 protein-coding and 95 RNA genes is part of the Genomic Encyclopedia of Bacteria and Archaea project. Strain UQM 2034T (DSM 2588 = ATCC 43595 = KCTC 3412) is the type strain of the species Chitinophaga pinensis and was first described in 1981 by Sangkhobol and Skerman . In 1981, strain UQM 2034T was described as a long, filamentous, gliding microorganism isolated from an infusion of litter from the base of a pine tree in Alderley, Brisbane, Australia . In 1999, the phylogenetic position of C. pinensis was determined. 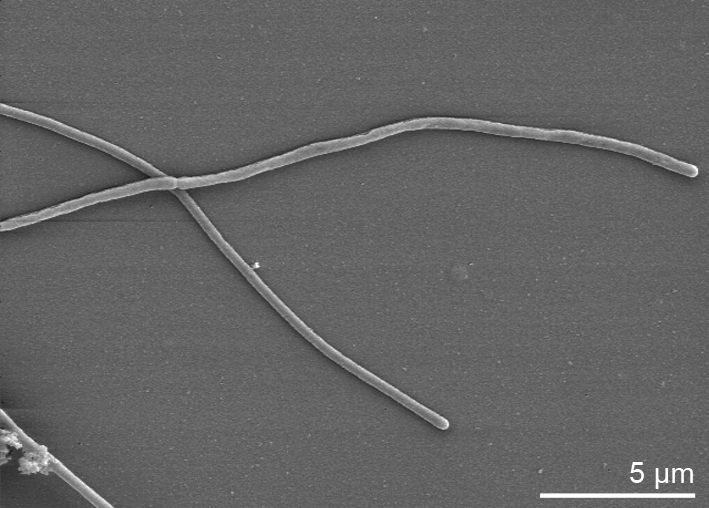 The comparison of 16S rRNA sequences revealed Flexibacter filimoris as the most closely related bacterium . In 2006 Kämpfer et al. reclassified F. sancti, F. filiformis, F. japonensis and Cytophaga arvensicola to the monospecific genus Chitinophaga and proposed C. skermanii sp. nov. . In recent years the number of newly described species belonging to the genus Chitinophaga increased. Two additional new Chitinophaga species were described in 2007, C. ginsengisegetis sp. nov. and C. ginsengisoli sp. nov. isolated from soil of a ginseng field in South Korea . In the same year Kim and Jung described the new species C. terrae sp. nov . In 2009, three additional Chitinophaga species were described: C. niabensis sp. nov. , C. niastensis sp. nov , and C. rupis sp. nov . Here we present a summary classification and a set of features for C. pinensis UQM 2034T, together with the description of the complete genomic sequencing and annotation. The most similar 16S rRNA gene sequences from cultivated strains that are stored in GenBank originate from isolates belonging to different species of the genus Chitinophaga: C. sancti, C. filiformis and C. ginsengisoli with 96-97% sequence similarity; all of them were isolated from soil samples. In metagenomic surveys of environmental samples only 16S rRNA genes with sequence similarity values below 92% to C. pinensis were detected, indicating that members of this species are not abundant in the so far genomically screened habitats (status July 2009). Figure 1 shows the phylogenetic neighborhood of C. pinensis UQM 2034T in a 16S rRNA based tree. The sequences of the six copies of the 16S rRNA gene in the genome differ by up to five nucleotides, and differ by up to 21 nucleotides (1.4%) from the previously published sequence generated from ACM 2034 (AF78775). Most likely this discrepancy is caused by sequencing errors in the publicly available C. pinensis 16S sequence. 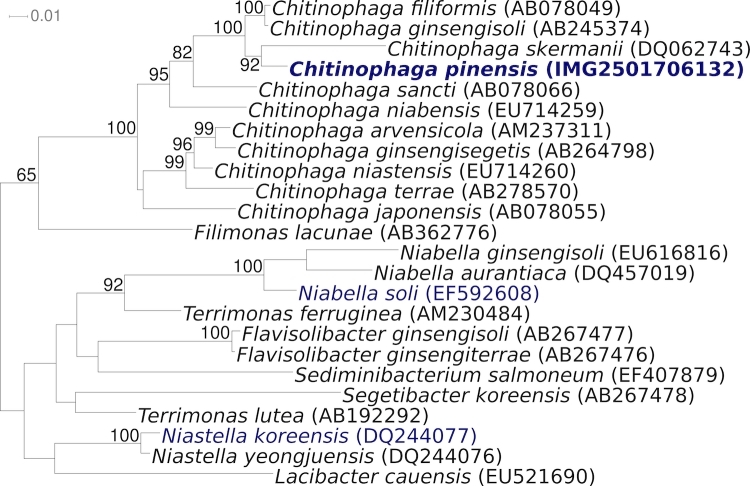 Phylogenetic tree highlighting the position of C. pinensis UQM 2034T relative to the other type strains within the genus and selected other type strains within the family ‘Chitinophagaceae’. The tree was inferred from 1,410 aligned characters [8,9] of the 16S rRNA gene sequence under the maximum likelihood criterion  and rooted in accordance with the current taxonomy. The branches are scaled in terms of the expected number of substitutions per site. Numbers above branches are support values from 1,000 bootstrap replicates if larger than 60%. Lineages with type strain genome sequencing projects registered in GOLD  are shown in blue, published genomes in bold. Cells of C. pinensis stain Gram-negative and form long, filamentous, flexible rods with rounded ends (Table 1). They occur singly and measure 0.5-0.8 by 40 µm in the mature gliding stage. Figure 2 shows cells of C. pinensis during cell division before separation. Upon aging, they transform into spherical bodies without the production of fruiting bodies. Myxospores with a diameter of 0.8-0.9 µm are formed. On charcoal yeast extract agar (CYEA) a yellowish pigment is produced. The temperature for growth ranges from 12-37°C with an optimum of 24°C. The optimal pH for growth is 7, but growth is possible in a wide pH range from 4 to 10. NaCl concentrations of 0-1.5% (w/v) are tolerated . Evidence codes - IDA: Inferred from Direct Assay (first time in publication); TAS: Traceable Author Statement (i.e., a direct report exists in the literature); NAS: Non-traceable Author Statement (i.e., not directly observed for the living, isolated sample, but based on a generally accepted property for the species, or anecdotal evidence). These evidence codes are from of the Gene Ontology project . If the evidence code is IDA, then the property was observed for a living isolate by one of the authors or an expert mentioned in the acknowledgements. Strain UQM 2034T produces acid from glucose, lactose, and sucrose. Chitin, casein and gelatin are hydrolyzed, whereas according to Sangkhobol and Skerman (1981) cellulose, starch, alginate, and agar are not hydrolyzed . Nitrate is not reduced to nitrite. C. pinensis UQM 2034T produces urease and is catalase and oxidase positive [1,3]. UQM 2034T is susceptible to tetracycline, streptomycin, and chloramphenicol and resistant to neomycin, kanamycin, penicillin G, and erythromycin . C. pinensis UQM 2034T is able to lyse Staphylococcus aureus cells but not cells of Escherichia coli, Pseudomonas aeruginosa and Bacillus subtilis . The fatty acid profile of strain UQM 2034T revealed C15:0 iso (30.4%) and C16:1ω5c (33.2%) as the major fatty acids and C17:0 iso-3-OH (11.5%) and C15:0 iso-3-OH (3.1%) as the major hydroxyl fatty acids. MK-7 is the predominant menaquinone . The polar lipid composition has not been analyzed, but phosphatidylethanolamine is reported for C. rupis . Two Sanger libraries: 8kb pMCL200 and fosmid pcc1 Fos. One 454 pyrosequence standard library. C. pinensis UQM 2034T, DSM 2588, was grown in DSMZ medium 67 (CY-Medium)  at 22°C. DNA was isolated from 0.5-1 g of cell paste using Qiagen Genomic 500 DNA Kit (Qiagen, Hilden, Germany), with a modified protocol for cell lysis (st/LALMP), as described in Wu et al. . The genome was sequenced using a combination of Sanger and 454 sequencing platforms. All general aspects of library construction and sequencing performed at the JGI can be found at the JGI website (Web Site). 454 Pyrosequencing reads were assembled using the Newbler assembler version 1.1.02.15 (Roche). Large Newbler contigs were broken into 2,046 overlapping fragments of 1,000 bp and 9,925 of them entered into the final assembly as pseudo-reads. The sequences were assigned quality scores based on Newbler consensus q-scores with modifications to account for overlap redundancy and to adjust inflated q-scores. A hybrid 454/Sanger assembly was made using the parallel phrap assembler (High Performance Software, LLC). Possible mis-assemblies were corrected with Dupfinisher or transposon bombing of bridging clones . Gaps between contigs were closed by editing in Consed, custom primer walk or PCR amplification. A total of 882 Sanger finishing reads were produced to close gaps, to resolve repetitive regions, and to raise the quality of the finished sequence. The error rate of the completed genome sequence is 0.01 in 100,000 nucleotides. Together all sequence types provided 26.3× coverage of the genome. The final assembly contains 91,161 Sanger and 876,658 pyrosequencing reads. The genome is 9,127,347 bp long and comprises one main circular chromosome with a 45.2% GC content (Table 3 and Figure 3). Of the 7,397 genes predicted, 7,302 were protein coding genes, and 95 RNAs. In addition, 110 pseudogenes were also identified. The majority of the protein-coding genes (62.4%) were assigned with a putative function while those remaining were annotated as hypothetical proteins. The distribution of genes into COGs functional categories is presented in Table 4. The predominant characteristic feature of C. pinensis is the ability to degrade chitin, a β-1,4-glycosidic linked homopolymer of N-acetyl-D-glucosamine and one of the most abundant polysaccharides in nature. It is a component of fungal cell walls and of arthropod exoskeletons. Chitin is degraded by chitinases (EC 3.2.1.14); endochitinases randomly cleave within the chitin molecule and exochitinases hydrolyze diacetylchitobiose from the end of a chitin chain. Diacetylchitobiose is further degraded to N-acetylglucosamine by the action of N-acetylglucosaminidases (EC 3.2.1.52). These glycosidic bond hydrolyzing enzymes were grouped in glycoside hydrolase (GH) families based on amino acid sequence similarities (Web Site) . For the C. pinensis genome 169 glycoside hydrolases belonging to 49 different GH families are predicted; 18 of the predicted glycoside hydrolases belong to GH family 43 which contains xylosidases, xylanases, arabinanases, arabinofuranosidases and galactosidases. Because of the chitin degrading ability of C. pinensis a great number of chitinases was expected to be encoded in the genome. According to the CAZY-database, exochitinases and endochitinases belong to GH families 18, 19 and 48. As estimated, there were several glycoside hydrolases predicted, which may be involved in chitin degradation; five members of GH family 18 (Cpin_2184, Cpin_2186, Cpin_2580, Cpin_3805, Cpin_3919) and three members of GH family 19 (Cpin_5850, Cpin_5553, Cpin_5898). The comparison of the amino acid sequence from these chitinase candidates to the databank BlastP indicated no homologs according to the whole length of the proteins. However, similarities to the known GH family domains were observed. The search for N-acetylglucosaminidases (EC 3.2.1.52) in the genome of C. pinensis revealed gene Cpin_3944 which encodes a protein with a GH family 20 domain. The predicted GH family 20 domain resembles the well characterized catalytic domain of a N-acetylglucosaminidase from Serratia marcescens . Further N-acetylhexoaminidases of C. pinensis are encoded by the genes Cpin_1798, Cpin_4994 and Cpin_1915. A second way to degrade chitin was described by Davis and Eveleigh in 1984 . First, the chitin molecule is deacetyliated by deacetylases (EC 3.5.1.41), afterwards chitobiose is released from chitosan by the action of chitosanases (EC 3.2.1.132), finally chitobiose is hydrolyzed by glucosaminidases (EC 3.2.1.52) and glucosamine molecules are released. One putative chitin deacetylase is encoded in the genome of C. pinensis. The deduced amino acid sequence of Cpin_6813 shows a GH family 19 domain and a C-terminal deacetylase domain. Chitosanases that are responsible for the hydrolysis of chitosan are mainly found in GH family 46 but also occur in GH families 5 and 18. In C. pinensis, no GH family 46 members were observed, but the presence of nine GHs belonging to family 5 and five members of GH family 18 are predicted. One of these glycoside hydrolases might have a chitosanase function. It remains unclear which pathway C. pinensis uses for the degradation of chitin and whether the predicted functions of the proteins match the real functions. We would like to gratefully acknowledge the help of Birgit Merkhoffer for growing C. pinensis cultures and Susanne Schneider for DNA extraction and quality analysis (both at DSMZ). This work was performed under the auspices of the US Department of Energy's Office of Science, Biological and Environmental Research Program, and by the University of California, Lawrence Berkeley National Laboratory under contract No. DE-AC02-05CH11231, Lawrence Livermore National Laboratory under Contract No. DE-AC52-07NA27344, and Los Alamos National Laboratory under contract No. DE-AC02-06NA25396, as well as German Research Foundation (DFG) INST 599/1-1. Davis B, Eveleigh DE. Chitosanases: occurrence, production and immobilization. In: Zikalis JP (ed. ), Chitin, Chitosan and Related Enzymes Academic Press 1984;161-179.